In most states Malaysians will cast votes in two elections: for the Dewan Rakyat and for the Dewan Undangan Negeri. The former is the lower house of the federal parliament, and the latter is the state parliament. 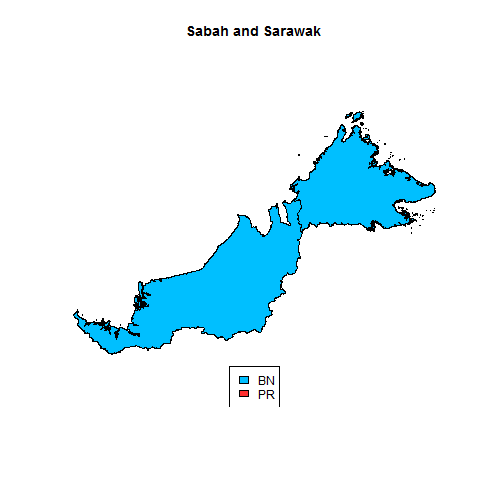 Sarawak is an exception because its elections are held on different days, and the three federal territories of Kuala Lumpur, Putrajaya, and Labuan don’t have state-level assemblies. In previous posts my focus has been on Dewan Rakyat elections, but state level results will matter too. 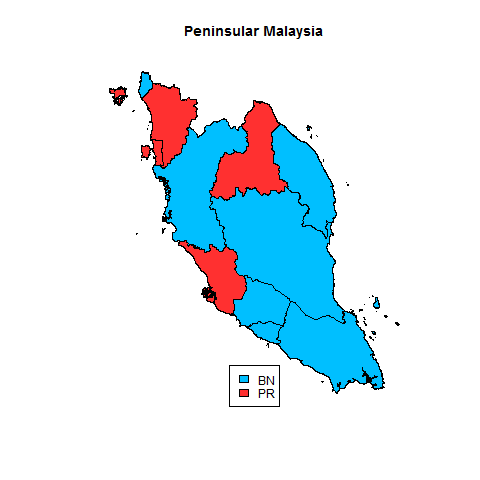 Here is a map of the peninsular states held by the Barisan Nasional (blue) and Pakatan Rakyat (red). Of course, the official opposition coalition only formed after the election. One of the blue states, Perak, was red after the 2008 election, but several PR reps jumped to the BN. Here is a map for the two East Malaysian states. For future posts a research assistant and I are working on creating maps of district level results (like this, but with data and code that are readily available for public use). For now, it suffices to note that the PR governments in the four states it holds are hoping that their record in local office will help to convince voters that they deserve a shot at national office too. Thanks for these great vignettes on Malaysia. Thanks for reading, Greg! I agree, these would be great things to visualize. Question: do you know where I can obtain data on urbanization and income at the electoral district level? Even if it’s only in hard copy, I can work on compiling it.